Nature Scene Investigators (NSI) is a clue-based outdoor program developed by Inside the Outdoors and Sage Hill School students. NSI is designed to have self-guided activities that make it fun and easy for families to enjoy Orange County's outdoor spaces and showcase the diverse natural and cultural resources in the area. 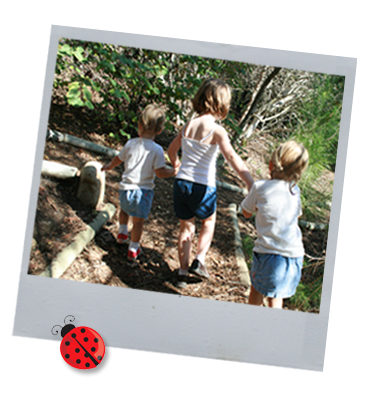 Using the NSI guidebook, families will chose a Mission (park) and then begin investigation of the area. A series of clues highlighting interesting facts about the park lead families to a final clue (a rubbing plate and code on a kiosk or post) which will answer the question posed as part of the Operation. As families search for the clue, they will be learning about the importance of parks, how getting outdoors makes them healthier, and simple fun activities they can do as a family to protect and conserve natural and cultural resources. The primary goal of the guide is to raise environmental awareness for children and families who have lost touch with nature, reconnecting them so that they are empowered to become environmental stewards. What Ethnicities Are Represented n Your Group? In order to learn how well the program works, we are also asking you to complete the following brief survey and fill out a final survey at the end of the project. This group data will be not be used for marketing, but will be used to determine program effectiveness and may be shared at science and zoo-related conferences and in publications. -The number of families and/or groups who register. -The number of families and/or groups who visit the various Safari sites. -The number of families and/or groups who attend one of the events sponsored by the partners. On average, how much time did you spend together out of doors during 2009? Approximately how many Orange County parks and outside recreation areas did you visit in 2009? How important is it for you to spend time together outdoors? Your mission is to explore several Orange County parks and investigate unique facts about each park. Your investigations will lead you through clues where you'll search for rubbing plates with secret codes attached to posts, kiosks, or benches. Be forewarned, your mission may require more tasks than just finding the rubbing plates. Follow the clues to complete each operation. Step 1: Register online or use the registration page in your NSI Operations Guide. You will need to be registered to be eligible for prizes. Step 2: Complete NSI Operations. There are 11 NSI locations. Many are accessible by city bus, either directly on the bus route or within a short walking distance. Some are accessible by hiking and biking trails and some are right on our city streets. Groups are encouraged to walk, skip, bike, roller skate, and skateboard to these locations. Use the clues to find the rubbing plate. The rubbing plate is the key. Match up the symbol in your booklet to the symbol on the rubbing plate. Make a rubbing of the symbol into your booklet on the space provided using a crayon or other thick writing tool. Step 3: Complete the online survey or submit the survey in the back of your NSI book to be eligible for a special prize. See additional rules for prizes. Step 4: Join special Get Outdoors! OC events where secret missions will be given out and prizes will be awarded. Step 5: Get Outdoors! Have fun and be safe! NSI – Nature Scene Investigators – is a fun way for adults, children, and families to experience Orange County’s “great outdoors.” Set up like a mystery to be solved, participants follow a guidebook that provides clues leading to a rubbing plate and code (the key) at each of 15 different locations (NSI Operations). Along the way participants learn about various Orange County outdoor resources, get some exercise, have fun – and become eligible for prizes. NSI can be done using the guidebook or online. Who created NSI?” I’d like to update the answer to “NSI was designed by students at Sage Hill School in Newport Coast, and University High School in Irvine, as a Service Learning project in partnership with Inside the Outdoors®, OC Parks, and the OC Health Care Agency. NSI guidebooks are free. Participants may have to pay entry or parking fees at some locations. Check the Park Information section in the guidebook or online at www.getoutdoorsoc.com to learn which parks have entry or parking fees. Can we do this as a family or group? Yes! In fact, NSI is most fun when done as a family or in teams. Can each of my family members or friends sign up separately? Only one sign up per e-mail address is allowed. While a family or group of friends could sign up and participate multiple times using different e-mail addresses, we recommend that families and friends participate together under one registration. It’s more fun to do NSI as a team! How old do you have to be to do NSI? There is no minimum age, although children should obviously be with an adult when following clues at the locations. The entire family can enjoy NSI together – that’s the whole idea! Are the activities and locations safe for kids? The locations are all public parks, beaches, and historical sites and are supervised by various agencies. Parents should research each location to see if there are any special considerations that could impact their family. Parents should always accompany their children to the locations, supervise them at all times, and follow all park rules. A student selection team from Sage Hill School and University High School visited candidate locations and worked with the staff of OC Parks, the OC Health Care Agency, and Inside the Outdoors to select locations that highlighted the diversity of Orange County’s parks, beaches, and historical sites. Is NSI available in Spanish? A Spanish language version is being created and should be available soon. You can find out more about NSI at www.getoutdoorsoc.com or by calling Inside the Outdoors at (714)708-3885. First, get a guidebook, fill out the registration card, and turn it in. You can also register online at www.getoutdoorsoc.com. Then, visit the NSI locations and follow the clues to find the rubbing plate and the code solving the NSI Operation for that park. Once you have found all of the codes, turn in the code page at the back of the book (or enter the codes online). Each code turned in enters you into a drawing for a prize (only one entry per location, per group is allowed). Find all 16 codes to be eligible for the grand prize! Begin by picking up a guidebook and filling out the registration card inside. Complete your registration by dropping your card into one of the NSI drop boxes at designated parks, libraries, or REI stores. You can also mail the card to the address listed or register online at www.getoutdoorsoc.com. Where do I get a guidebook? Guidebooks are available at NSI Operation locations, local REI stores, and certain Orange County libraries. A list of locations can be found at www.getoutdoorsoc.com or by calling Inside the Outdoors at 714-708-3885. You can pick up a replacement book at any location where guidebooks are available. If you have already registered, your information and any codes you have already submitted will still be in our database. How long do I have to complete NSI? There is no deadline for completing the NSI Operations – and you don’t have to complete all of them. Do as many or as few as you like. Prizes will be drawn on a quarterly basis throughout the year. The NSI activity at each location doesn’t take very long. Participants are encouraged to spend more time exploring each location and to not rush through the activities. The whole idea of NSI is for you to get to know these great locations and to spend time outdoors as a family. Do I have to do NSI in a particular order? No, you can visit the locations in any order you like. There are 15 NSI locations throughout Orange County. For a complete list refer to the guidebook or www.getoutdoorsoc.com. You can also call Inside the Outdoors at 714-708-3885 for more information. How does the code card work? Each guidebook comes with a code card located at the back of the book. Once you have turned in the registration card, the code card is used to record and report your progress. After finding the code at a location, participants record the code and park name on the code card. Once you have completed as many NSI operations as you would like, turn in the code card to be eligible for the prize drawing. Each code submitted is an entry into the prize drawing. The more codes you turn in (one per registered participant per location), the better your chances of winning! Participants who turn in all 16 codes become eligible for the grand prize drawing. Where do I turn in the code card? Your code card can be dropped off at most locations where guidebooks are available or mailed to the address provided on the card. A complete list of drop-off sites can be found at www.getoutdoorsoc.com or by calling Inside the Outdoors at 714-708-3885. Participants who complete at least one NSI Operation (by finding the rubbing plate and code at participating park locations) and turn in a code card or enter the code online are entered into a drawing for a prize. The more NSI Operations you complete, the better your chances of winning. Participants who complete all of the NSI Operations become eligible for a grand prize. Prizes will be drawn on a quarterly basis throughout the year. How will I receive prizes? You will be notified by your contact e-mail or phone number if you have won a prize. Arrangements will be made at that time to get your prize to you. Do I have to do every activity to get a prize? No. Each code you find and turn in makes you eligible for prizes. It only takes one – but the more codes you find, the better your chances of winning a prize. However, to be eligible for the grand prize you must complete all 15 NSI Operations. The code is located next to the rubbing plate at each location. You’ll have to follow the clues to find them! What do I do with the rubbing plate? The rubbing plates are for creating an image in your guidebook. Making a rubbing is not required and you do not turn in your guidebook rubbing pages. It is a fun feature of NSI that will allow younger children, who may not understand the codes, to help solve the clues. To create an image from the rubbing plate, place the guidebook page specified on top of the rubbing plate, and with a writing utensil color your page and watch the image appear. Rubbings are best seen when using a crayon or pencil. Is there anything else to do at the locations? Yes – NSI introduces you to Orange County’s parks, beaches, and historical sites. We hope you will take the time to explore other things to do at each location – and come back often. What do I need to bring with me to the locations? Be sure you bring your guidebook or downloaded park pages and a crayon or pencil to do a rubbing at the rubbing plate and to copy down the code. Depending on the location you may want to bring items for safety and comfort, like sunscreen, water, snacks, jackets, etc. Be sure to read up on each location (or call the location) before going to see what you might need to bring to make your visit enjoyable. Are the locations wheelchair and stroller accessible? All of the locations have accessible areas that are accessible by wheelchairs, walkers, strollers, etc. – but not every section of every location may be fully accessible. Be sure to read up on each location (or call the location) before your visit to be sure your accessibility needs can be accommodated. Will there be someone at the locations to help me? Most locations have staff on-site, but a few do not. Be sure to check the hours of operation for each location to find out if staff members are available. Location staff members are aware of the NSI program and can help you make the most of your visit. Can I do a location more than once? We hope that you will visit these locations many times as you and your family spend more time in the outdoors together. Only one code submission per location is allowed for prize qualification. How does the online version of NSI work? The online version works the same as the guidebook version. Each NSI Operation’s guidebook page is online and can be downloaded. You can download and print out one or more Operation pages and take these with you when you visit the sites. You won’t need to turn in the code card, though; you can enter your code submissions online. Can I track my progress online? While you can register and submit codes online, you will not be able to track your progress online. To protect your privacy, personal account information is not kept online. You can keep your downloaded guidebook pages and fill them out with completed codes and rubbings. If you’d like to find out how many and which locations you have turned in codes for, you can contact Inside the Outdoors at insidetheoutdoors@ocde.us or 714-708-3885. Yes. The online version asks for minimal online information and all of that information is immediately transferred to a secure database managed by Inside the Outdoors offline. Your e-mail address or phone number is needed in order to contact you about prizes or NSI-related information, will not be sold or given to anyone. You will only be contacted for issues related to NSI. Who can I talk to if I have questions about the online version? You can contact Inside the Outdoors at insidetheoutdoors@ocde.us or 714-708-3885. Enter codes from rubbing posts here. You must be registered for NSI in order for your code to be valid. Click on the registration tab to register. ZIP Code: A value is required. A value is required.Invalid format.